With Halloween and Bonfire Night well out of the way, it’s okay to start thinking about Christmas, right? In fact, it’ll be here before we know it so we might as well spur into action and see what’s cropping up on this year’s wish lists. Those in the know have placed their bets on 2018’s best seller toys. And we’ve packaged up a few of our favourite trends. Pikmi Pops appears to be this year’s strong contender against LOL Surprise and Hatchimals Colleggtibles. These brightly coloured lollipop-style surprise balls include stickers, scented toys, accessories and lanyards. Shopkins’ Hairdorables are a little more pricey but come with 11 surprises to unwrap before the owner discovers who their cute mini doll will be. There are 36 varieties to collect – each with different hair, outfits and accessories. There’s even a YouTube ‘Hairdorables’ channel to foster strong loyalty and fandom. Anyone with kids is most likely used to having the tell-tale signs of this popular trend dotted around the house. With many kids avidly watching YouTube tutorials and making their own slime at home, parents are left to deal with slime residue on furniture and carpets. Hamleys recently showcased Elasti Plasti in its six brightly coloured pots. The slime expands by up to 100 times, makes weird and wonderful noises, and can be blown into large bubbles. So Slime DIY Slime Factory is the ultimate do-it-yourself kit that makes neon, pastel and metallic slime along with confetti, glitter and sprinkles. It’s never too early to get the young ones into coding. Given the attention and hype that AI gets, it’s not surprising that a few gadgets caught our eye. Botley the Coding Robot is aimed at the early years and teaches kids programming skills with stickers, coding cards and activity accessories. Boxer is a pocket size AI robot who comes with a mini remote control and tiny football. His cute facial expressions change throughout the 10 game cards. Last, but not least, we have the BB-9E App-Enabled Droid that parents will pretend to buy for their kids but probably end up playing with themselves! It’s an updated version of last year’s droid from soon-to-be-released The Last Jedi movie and uses a smart device to control it. Yep, this trend shows no sign of abating. Be it ride-on unicorns that have castor wheels inside the hooves for an authentic ride – or Vtech’s Myla Fantasy Unicorn that comes with a wand that changes the colour of the unicorn digitally. But the one that really tickles us (or our toes) is a craft kit that converts a pair of stripy socks into your very own personal unicorn pet. 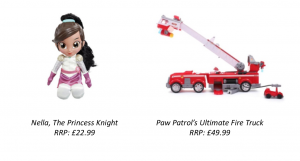 These popular toys continue to dominate seasonal gifting but the two that stand out are both by Viacom IP: Paw Patrol’s Ultimate Fire Truck which comes with a super cool extendable ladder, and Nella The Princess Knight Talk and Sing doll which says 10 phrases and sings the program’s theme tune. Both toys are popular with pre-schoolers. Some things never go out of fashion – like toys designed to encourage role play. Mini kitchens and supermarkets have always been popular but we love this fancy option by Waitrose which also helps build brand familiarity at a young age. Aspiring mechanics and engineers will enjoy the Bosch Toy Workbench which comes packed with tools, accessories, and sound effects for realistic play. Brilliant for kids to play together and boost their social skills. Playmobil City Life Wedding Limo is somewhat traditional with its limo containing a bride, groom, and a driver. It comes with flowers, champagne and glasses, a tin can trail and veil. It says that the bride cannot fit into the driver’s seat so, if there is a runaway bride scenario, at least the driver will come in handy! Razor Kids is our specialist kids and family research unit. We turn chatter into commercial insight. To find out how we can help your brand, get in touch with #LesleyRazor or #ChloeBRazor.